First the burgers. Put the breadcrumbs, garlic, coriander, mint sauce, onion and salt and black pepper in a food processor. Blend until it’s just combined with a fairly coarse texture. Tip into a bowl, add the mince and mix together. Using wet hands, shape into 8 burgers, then place on a baking tray, cover and chill in the fridge until needed. Now the tomato relish. Heat the oil in a saucepan, add the onion and garlic, then cover with a lid and fry over a medium heat for 5–7 minutes, or until soft. Add all the remaining ingredients to the pan, stir, bring to the boil and cook for 2–3 minutes. Season with salt and pepper, then cover again with the lid, reduce the heat and leave to simmer for about 10 minutes. Then the mint mayonnaise. Mix all the ingredients together in a small bowl. To cook the burgers, light the barbecue and let the flames flare up and die down or alternatively heat oil in a large frying pan. Barbecue or fry the burgers for about 3–4 minutes on each side or until browned and cooked through. To serve, slice the buns in half and toast the cut side. 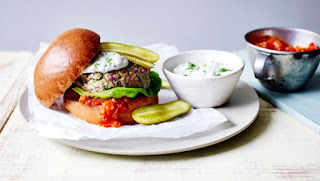 Spread one half of each bun with the tomato relish and add a lettuce leaf, a burger, a dollop of mint mayonnaise and a few slices of gherkin before popping on the top half of the bun. Go on, enjoy.